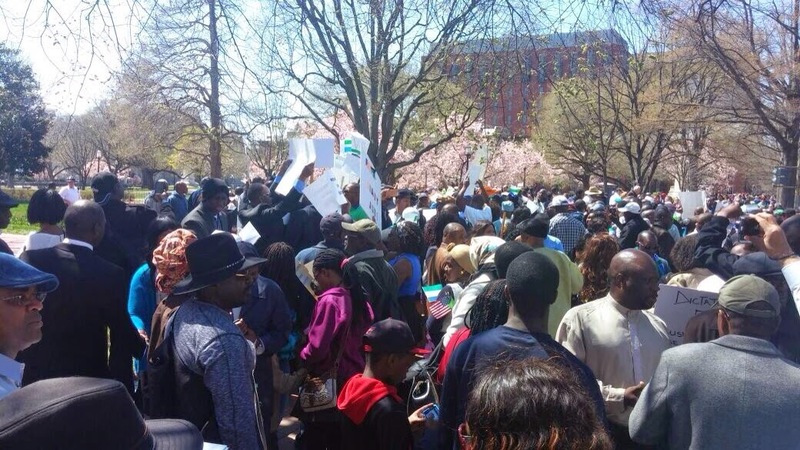 Many wearing green, from across North America and Europe, the group of a hundred or more people included high-profile figures, such as the wife of Kandeh Yumkella, who recently announced his resignation as director general of the United Nations Industrial Development Organization (UNIDO). 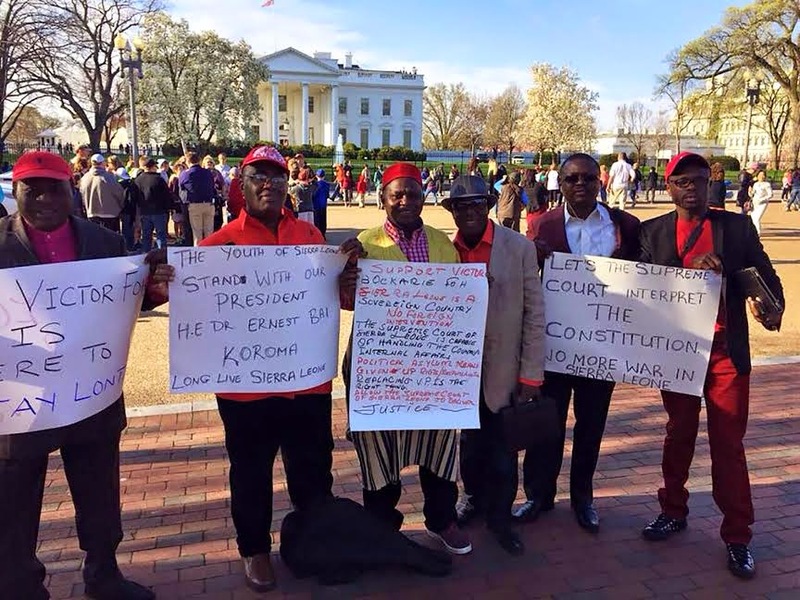 Yumkella reportedly donated $2,000 to the movement leading the debate in the biggest constitutional crisis since Sierra Leone's decade-long war. 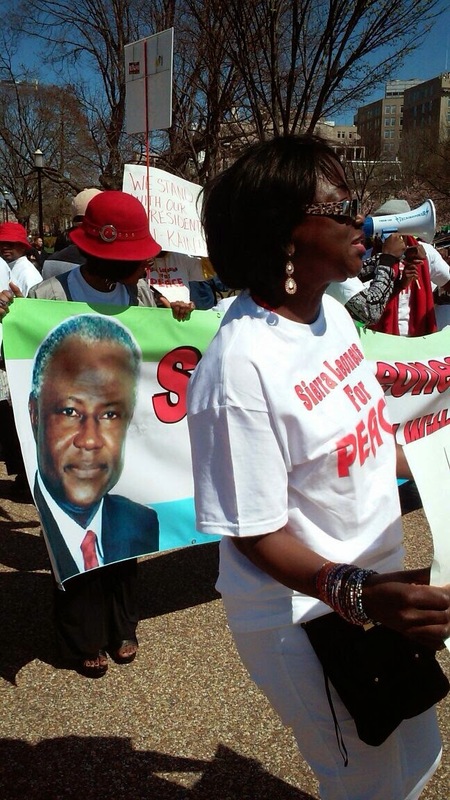 A counter demonstration, staged in support of what is seen as President Koroma’s legitimate use of supreme executive authority, was organized by Sierra Leoneans for Peace. President Koroma’s ruling All People's Congress (APC) party accused Sam-Sumana of creating his own political movement and expelled him from the party, before he was sacked by Koroma for abandoning his duties by requesting asylum at the United States Embassy in Sierra Leone’s capital Freetown. Koroma later chose Victor Bockarie Foh, ambassador to the People's Republic of China, to replace Sam-Sumana over the objections of the opposition, which said he is not eligible to hold the position. “We welcome all Sierra Leoneans, Sierra Leone natives, and friends of Sierra Leone to join us in defense of Sierra Leone's Constitution, rule of law, and public accountability for Ebola Funds. “We will have up to three dozen (U.S.) Marshalls deployed working with the National Park Police to identify and remove/arrest trouble makers,” Wai wrote in a press release before Saturday’s rally. Five thousand miles away, Sierra Leone’s government prohibited marches on public sidewalks or streets, or rallies in public parks and denied permits for demonstrations that don’t present serious traffic, safety, and competing-use concerns beyond those presented on a daily basis by ordinary use of the streets and sidewalks. In Washington D.C. Saturday, protesters were able to shout down each other in front of the White House. 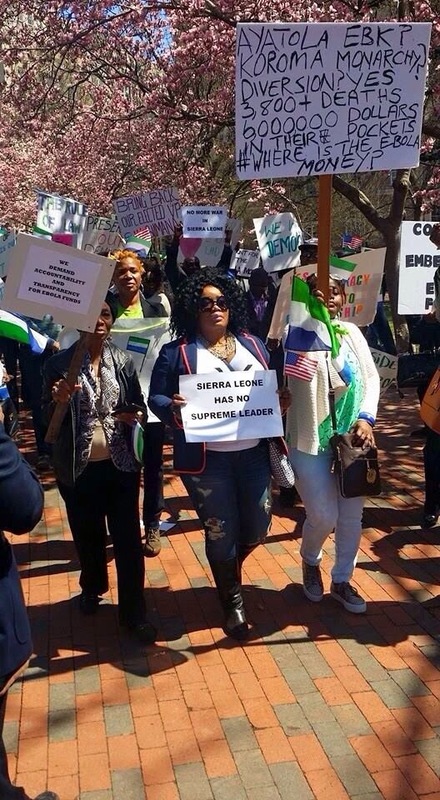 Some in the group supporting the ousted vice president held placards that read, "Sierra Leone has no Supreme Leader” and No room for Dictatorship in a Democracy" as well as “What happened to the Audit?” — A reference to the $18 million of treasury funds and public donations to combat Ebola, which has claimed around more than 3,800 lives there. A February government audit determined that $6 million is unaccounted for and may have been used to pay "ghost" workers who do not exist. The audit also determined that there is no documentation for an additional $10.2 million. “I think DEMOCRACY is the absolute winner today. This is the first time Sierra Leoneans have gathered in one place to oppose each other without stones and insults flying around. 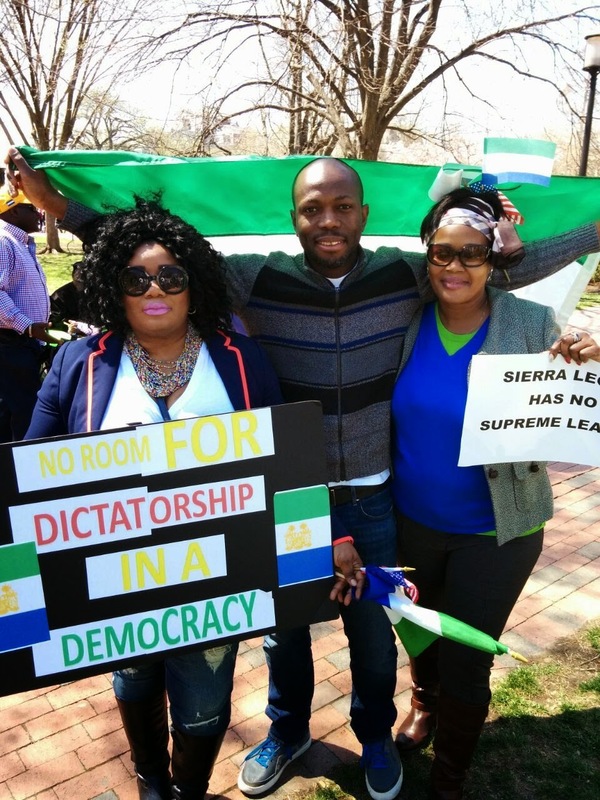 This is a testament that Sierra Leoneans in the diaspora have learned a unique and mature way of expressing their disagreement without being brutal to each other. Both sides should be congratulated and thanked for this exercise of peaceful freedom of speech. 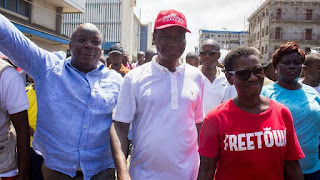 Defiant opposition Sierra Leone People’s Party U.K. and Ireland Chairman Jimmy Batilo Songa has said in an interview that Sierra Leoneans in the United Kingdom will continue to protest until constitutional order is restored by President Koroma in Sierra Leone. 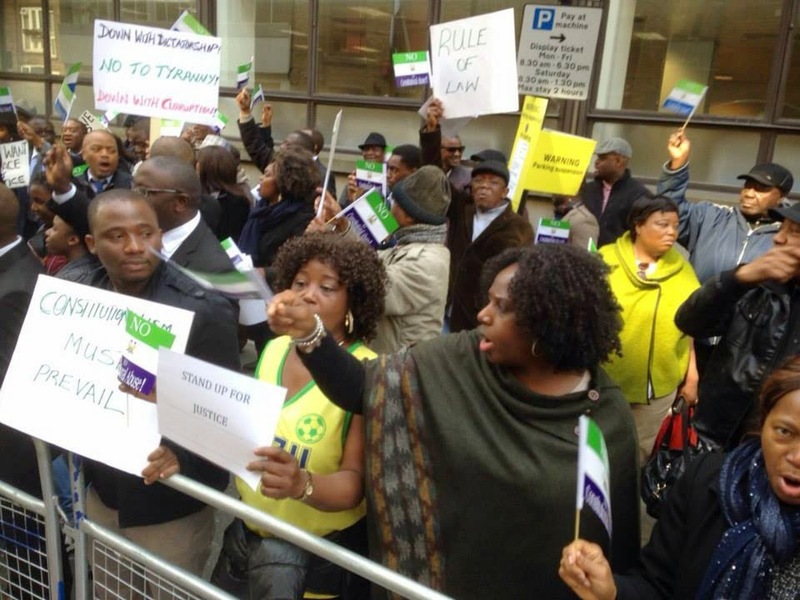 Speaking after the demonstration organized in London Thursday, Songa insisted that Sierra Leoneans across political parties in the United Kingdom are united and determined to ensure that President Koroma must respect the constitution which is the highest law of the land. The biggest concern with planned protests, however, is not so much about yea or nay, but efficacy, noted one political pundit. 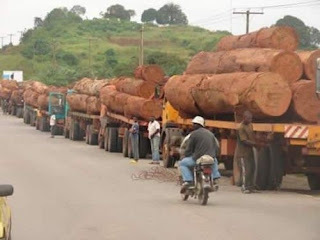 “While the protests may produce benefits, for example, the symbolic importance of Sierra Leoneans taking action, coalition building, shaping of a concise/coherent message re crisis, etc., I'm not so sure they can produce the desired results the organizers have advertised. “As such, I would hope the organizers are pursuing a two-track approach, with effective lobbying and advocacy representing the other prong. Despite inherent challenges, smart engagement of influential U.S., U.K. and U.N. officials/legislators offers a better chance of dividends."